Author of publications on Afrikaans linguistics. 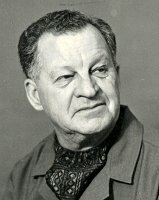 Willem Kempen was born on 3 July 1909 in Prieska. He attended school in De Aar and studied at the universities of Stellenbosch (Ba, Ma 1932, DLit 1937) and Utrecht. Title of doctoral thesis: Die na-oorlogse mens in die Nederlandse letterkunde. He served Stellenbosch University as lecturer from 1935 and from 1948 as professor of Afrikaans Linguistics until his retirement in 1974. He was Dean of the faculty of Arts and Letters for seven years. In 1947 Willem Kempen spent a year on studies in Holland and Belgium. He returned to these and other European countries for several times to do linguistic research and give lectures. Co-editor of the Woordeboek van die Afrikaanse Taal and co-translator of the Afrikaans Bible. Member of the South African Academy of Arts and Science since 1948 and chairman of the Taalkomissie (Afrikaans Language Comission). Member of the Board, South African Cultural Museum in Capetown. Wrote many articles for Die Burger, Ons eie boek and other newspapers and journals. Gave many popular talks, also for the radio, where - from 1958 - he took part in programmes on the Afrikaans language (One of them was Ons dink ons ken Afrikaans, 1970). Willem Kempen enjoyed stamp collecting, gemstones and Begonias. He was married to Elizabeth du Plessis in 1938. They had two boys and two girls: Deon, Willem Adriaan, Susanne and Elizabeth. He died on 23 July 1986 in Stellenbosch. The author of children's books, Flooi du Plessis, was his nephew.